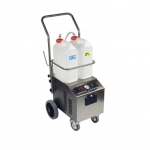 Our steam cleaners have an internal tank with a 2.5L - 10.0L capacity. Tap water is used to make steam at 4.5 bar - 10 bar pressure and produces steam vapour temperatures at up to 185° Celsius. The steam boiler, manufactured in stainless steel, is explosion proof and safety devices provide steam pressure at both constant and variable rates. Morclean's steam cleaners, providing a large amount of over saturated steam, will hygienically clean all surfaces. 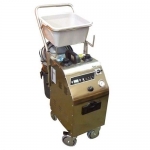 There are no restrictions on how the steam cleaners unit could be used, however the steam cleaners are mostly utilised for cleaning and sterilising floors and tiles, catering equipment and kitchens, fridges, freezers, engineering, printing and textile applications. Cleaning by traditional cleaning methods remove dirt mechanically by water, but some dirt can remain in the pores of the surfaces. Disinfectants also act mainly on the surface, so bacteria can survive and be ready to grow again. The cleaned surface reflects the light and looks sparkling, but it's only a visual impression of cleanliness. To clean by high temperature steam reaches the organic materials deep down the surface. The dead organisms, even in the innermost pores, can then be removed by using only water and micro fibre cloths. New germs cannot find a proper ground to grow. Rinsing water, residuals and wastes are all 100% biodegradable. 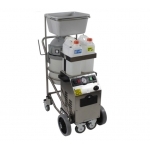 Vision Steam CO3000 A tough and robust machine designed to enable cleaning of the highest quality to be undertaken whatever and wherever the job. 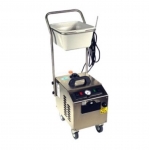 The steam super-heated to 180?C nominal and delivered at 8 bar pressure allows the detailed cleaning of a huge variety of surfaces ñ from the sanitising of kitchen, baking and food manufacturing equipment to road film, graffiti and gum removal. The chemical injection facility allows the use of a suitable mild cleaning agent. 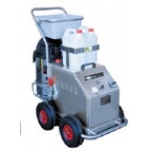 The industrial strength vacuum enables the simultaneous removal of moisture and the residue of grease and grime. 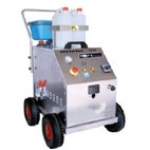 A steam cleaner specifically for continuous use with detergents or other additives at low dosage. 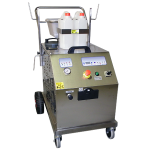 A special controller regulates the injection of detergents into the steam, greatly enhancing the speed and efficiency of the steam. It is ideal for the removal of chewing gum, grease, baked on food residue, mould, etc. 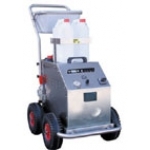 10 litre canisters for water and detergent allow for hours of non stop use. Compact, robust and extremely flexible for easy gum removal.